With this powerful line, Slush Singapore delivered its 2nd edition on Friday, the 14th of September 2018. With an ethos about action and sparking conversation, and it’s one of the largest events for all you tech-heads out on this sunny island. This year’s Slush was all about celebrating technology and entrepreneurship. For an event that hosted close to 3,000 attendees, it was music to our ears to hear that Slush Singapore is taking great steps in sustainability. Slush Singapore began its green journey last year with cool activities like cycling to the afterparty and sipping sustainably-brewed coffee by Bettr Barista and Incon Green’s reverse vending machines. That got us really excited for their next few steps at Slush Singapore this year. So what did we see at Slush Singapore? 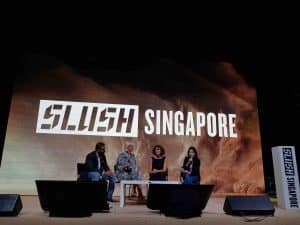 A step-up from 2017, Slush Singapore 2018 featured a Sustainability panel on the topic of the Circular Economy. Featuring Reverse Resources, Nusa Sentara and a GITNB member, Winnow Solutions, the panel was moderated by Managing Director of Eco-Business and our dear friend, Jessica Cheam. 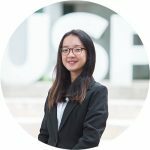 Highlighting environmental issues such as resource scarcity, pollution, and waste production, the speakers emphasized the need to look away from the linear (take, make, waste) economic model and move towards a circular one. So how do we deal with the amount of waste already accumulated? Natasha Viitasaari of Nusa Sentara noted that moving towards a zero-waste goal requires major infrastructural changes to deal with these problems. Nin Castle, from Reverse Resources, added that all stakeholders must communicate with each other in order to enable the circular economy. Sagar Mahagaonkar of Winnow Solutions shared that sustainability is not discussed very much in Southeast Asia, and it’s all about changing mindsets and shifting the status quo. People are reluctant to be the pilot case and want to see results, but it was heartening to see these eco-warriors hustling hard to make the world a better place. Slush Singapore provided water refill points for delegates to ditch single-use plastics where possible and refill their bottles instead of using the plastic cups provided. These tanks conveniently situated all around the event site significantly reduced the need for single-use plastic bottles. Slush Singapore made the move to feature plant-based food on site! We were so ecstatic to see some GITNB friends, Lembas and Made Real, putting up their booths and sharing their goodies and company philosophies to the participants. UglyFood also gave out free juices made from ugly fruits to media partners and executives and we hope that the glass bottles were recycled as well. What’s an entrepreneurship event without the start-ups? We were blown away by the innovations shown by these start-ups and we were beaming as we listened to environmental start-ups share their solutions to help save the world. N.thing provided cool new solutions to urban farming. Dresstal is a Malaysian dress rental company promoting sustainable fashion. Globallygood is a Vietnam-based organisation that aims to link socially conscious doers to communities who need help. Rove enables electric car-sharing and is “like Uber, but greener”. We were also lucky enough to catch speakers like Astroscale, a company focused on cleaning space debris and raising space-related environmental issues, as well as ImpossibleFoods, who are making plant-based meat that’s good for the planet and making the impossible so very possible. Consider us blown away. 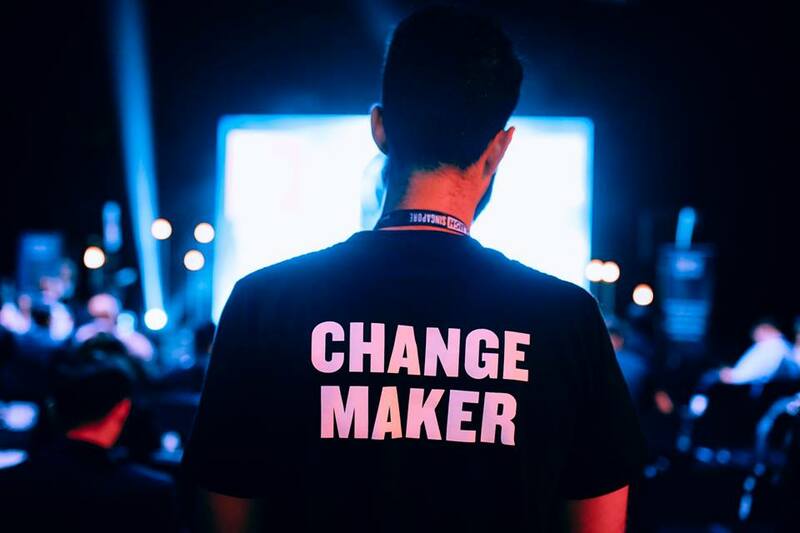 Speaking of sparking conversation, Slush Singapore saw volunteers holding up handmade signs with controversial environmental topics that got you thinking. From questions like “Would you eat lab-grown meat?” to “All economies should be circular. Y/N?”, these volunteers were actively engaging with delegates and having discussions about deep environmental issues that many may not have known about. Our minds were tickled and hearty conversations were had. Kudos to these eco-warriors! What else can Slush Singapore do? Laudable in their efforts (though not perfect), we are heartened to see Slush Singapore take a big green step forward. While great, we hope that Slush Singapore will continue to work towards being more green in its future iterations. From ditching single-use disposables altogether, opting to go electronic rather than giving out flyers, and supporting more green initiatives, the road to sustainability is a long one but we are positive that it is possible and worthwhile to make that journey. We are excited for the next edition of Slush Singapore and hope to see more green efforts undertaken by other mega-events in Singapore, too. We’re all about these #LittleGreenSteps. *Cover photo from Slush Singapore’s Facebook page.